The Madison River is caught in the hazy and lazy days of summer like the rest. Anglers not bothered by the forest fire smoke are doing well on the Madison in the morning hours. 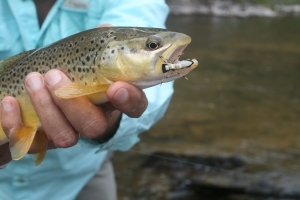 A variety of Hoppers sizes 10-12 are working as well as streamers in the afternoon. Temperatures are predicted to be in the 70-80 degree range for the next week or so, and the smoke is slowly clearing.